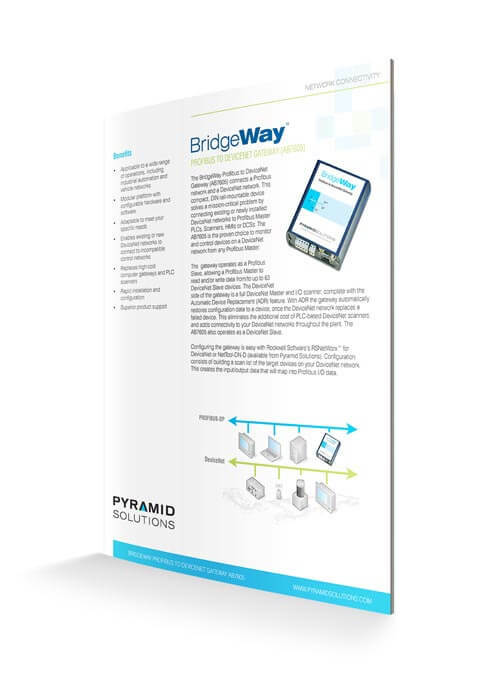 The BridgeWay™ PROFIBUS to DeviceNet™ Gateway (AB7605) provides connectivity between a PROFIBUS-DP network and a DeviceNet network. This compact, DIN rail-mountable device solves a mission-critical problem by connecting existing or newly installed DeviceNet networks to PROFIBUS DP-Master PLCs, Scanners, HMIs or DCSs. The AB7605 is the proven choice to monitor and control devices on a DeviceNet network from any PROFIBUS-DP Master. 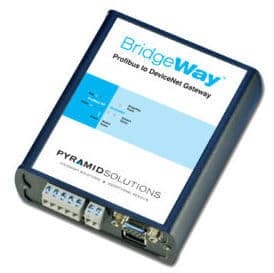 The gateway operates as a PROFIBUS-DP Slave, allowing a PROFIBUS-DP Master to read and/or write data to/from 63 DeviceNet Slave devices if desired. The DeviceNet side of the gateway is a full DeviceNet Master and I/O scanner, complete with the Automatic Device Replacement (ADR) feature. With ADR, the gateway automatically restores configuration data to a device, once the DeviceNet network replaces a failed device. 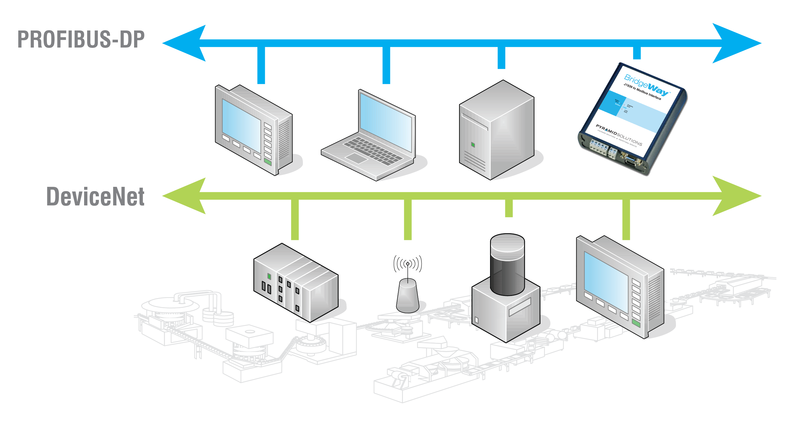 This eliminates the additional cost of PLC-based DeviceNet scanners and adds connectivity to your DeviceNet networks throughout the plant. The AB7605 can also operate as a DeviceNet Slave. Configuring AB7605 is easy with Rockwell Software’s RSNetWorx™ for DeviceNet or NetTool-DN-D (available from Pyramid Solutions). Configuration consists of building a scan list of the target devices on your DeviceNet network. This transforms the input/output data maps into PROFIBUS-DP I/O data. Note: Need NetTool-DN-D (available from Pyramid Solutions) or RSNetworx to configure the module’s DeviceNet Master scan list.